Whether you're adding a new outdoor area such as a patio or deck this spring, or just need some updated furniture for an existing area, now is the best time to start planning for and buying your outdoor furniture. When the warm weather finally decides to stay for more than a day or two, you'll have a relaxing, inviting oasis ready for you, your family, and guests to enjoy. With so many options for outdoor furniture, how do you choose the best pieces for your space? In this multi-part series to be continued next month, we'll discuss some options, beginning with considering how your space will most often be used. How you use your space will be one of the greatest factors in determining what pieces to choose for your outdoor area. If you have a large space, you could consider creating separate “zones” or areas designated for specific purposes. If space is limited, choosing your furniture based on how you most often spend your time outdoors will help you maximize your space. Here a few ideas. Outdoor dining space: Do you and your family enjoy eating meals outdoors? If so, a patio table will likely be a top priority, with a few other furnishings added as space allows. If you have the space, a table with enough seats for everyone in the family is ideal so that you can enjoy meals together just as you would indoors. For smaller families or smaller spaces, pub-style bar sets work well. If your outdoor area is not covered or naturally shaded from the sun, an umbrella that either fits into your table or is freestanding and easily movable is essential for sun protection and added comfort. Another option to consider if you have the space is an outdoor buffet table, which provides a practical place to sit drinks, serving dishes, desserts, or extra tableware without having to get them from inside. Outdoor seating area: Perhaps outdoor dining isn't for you, but you do enjoy relaxing outdoors when you get the chance. A few comfortable chairs with some end tables or a coffee table would create a great spot for you and a few others to relax. If you have the space, including a chaise lounge as a seating option, or adding a few ottomans to go with your chairs, is a nice option for times you want to really kick back. Outdoor living room: If you're the type who loves to spend hours relaxing outdoors, an outdoor living room could be perfect for your space. Outdoor living rooms typically consist of a combination of cushioned sofas, loveseats, chairs, and ottomans—along with occasional tables—for ultimate comfort and relaxation. If you plan to have an outdoor living room that is not covered by a roof or awning, a deck storage box is an attractive and convenient way to stow cushions away from the elements when they're not in use. Front porch: Nothing beats the charm of a pair of rocking chairs or an inviting porch swing or glider. Cushioned chairs paired with end tables also make a welcoming impression. Other outdoor focal areas: If your property has a special focal area—a pool, pond, water garden, flower garden, outdoor fireplace, or more—creating a comfortable place to relax around that area might be a priority for you, since that's likely where you'll end up spending time. Chaise lounges, chairs and ottomans, freestanding A-frame swings, and even small dining tables make an already-great outdoor area even more enjoyable! 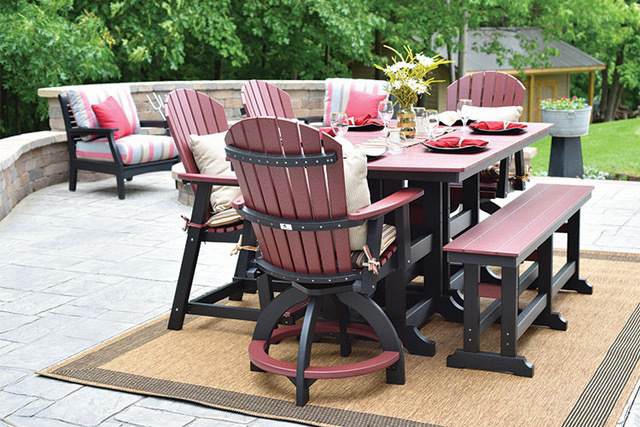 If you're ready to start planning your outdoor space, take a look at the outdoor section of millersfurniture.com for ideas, or visit either of our stores to get started. Our maintenance-free poly furniture will have you relaxing in the sun in no time!